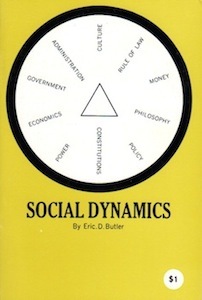 Social Dynamics is the science of applying social power to social organizations in order that individuals may obtain the results they desire. Social power derives from the believe – faith – that individuals in society can in correct association get what they want. The decisive factor in the crisis threatening Civilization will be Faith. If sufficient individuals have sufficient Faith that they do posses the capacity to change the course of events from their present disastrous course, then the mountains obstructing man from entering into his rightful heritage will be removed.